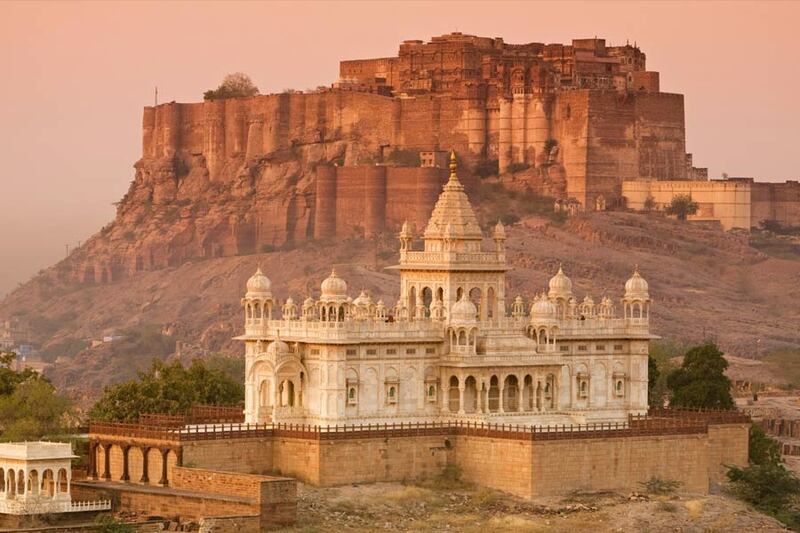 Jodhpur is also well-known for its heritage, culture and rich culture. This Blue city of Rajasthan was founded in 1459 by Rajput Chief Rao Jodha. It is famous for magnificent palaces and forts that attract large number of tourists from different parts of the world. Rajputana India Tours is here to offer Jodhpur heritage walk tour to explore this city, which is situated on the edge of the Thar Desert. 1. 8:30 am – You will visit Mehrangarh Fort – The Foundation of the Fort was laid on 12th May 1459 by Rao Jodha on a rocky hill. This hill was known as BhaurCheeriya, the mountain of birds. To build the fort he had to displace the saint called Cheeria Nathji, the lord of birds. Cheeria Nathji cursed Rao Jodha, that your city people ever suffer a scarcity of water. And due to this reason, Rao Jodha buried a man called Rajiya Bhambhi alive in the foundations. Mehrangarh (‘Mihir’ (Sanskrit) -sun or Sun-deity; ‘garh’ (Sanskrit)-fort; i.e.’Sun-fort’; according to Rajasthani, ‘Mihirgarh’ has changed to ‘Mehrangarh’. 2. 10:00 am- You will walk towards Brahmpuri to witness some very old family owned temples with some very interesting related legends. Enjoy the pleasure of witnessing the delightful taste of the sweets & local Chai. This tour of Brahmpuri offers a complete insight of the historic city. This walking tour of Brahmpuri give a meticulous experience of this beguiling city. Get to know the interesting & retold legends from the past, peep into the life of the city meet and intermingle with the locals while walking through the alleys flanked by the Blue houses both the ends. Get known to “Hathai”; a special assembly of locals for gossiping. 3. 10:30 am – Padamsar (water reservoir) – Built by Mr. Padamsar, Minister in Mehrangarh Fort, for tarpan process of brahmins and earlier used for drinking water by local people. 4. 11:00 am Ranisar (water reservoir) – Built by princesses of Jodhpur and was used for drinking and bathing on special occasions. After this, you will enjoy your lunch and head back to hotel for short relaxation. You will be again picked-up from hotel around 1:40 pm and dropped at Chand Baori. 5. 2:00 pm – Visit Chand Baori which was built by Maharani Chand Kanwar, earlier it was used by local people for drinking water. 6. 2:20 pm – Visit Jeta Bera which was earlier the water of this well was used only by King’s family but now it is open for all general people. 7. 2:30 pm – Visit NavChowkiya wherein nine roads met at this center point that’s why it is called nav – chowk – iya. Earlier this place was used for solving judicial matters and maintaining the land records. 8. 2:40 pm – Visit PungalPara as this area is famous for sweets made by milk, more than 20 shops in the single row. Gulabjamum & Mewa are the main sweets. 9. 2:50 pm – Visit Gangshyam ji Temple – Rao Ganga was married to Padamawati, daughter of Rao Jagmal of Sirohi. The statue of Krishna that Jagmal worshipped was very much liked by Princess Padmawati. After marriage, while leaving Sirohi, Padamawati asked her father for the statue but Jagmal had refuse because he also loved this statue very much. Then Padmawati asked Gangaji to take the statue from Jagmal in dowry. On doing so, Jagmal sent Pandit Jeevraj along with the statue. Gangaji established the statue in the fort and it came to be known as Ganga Shyamji. After some days it was transferred to Ghan Shyamji Temple in Old Dhan Mandi and later a big temple was made for it in Old Dhan Mandi which is now known as Gang Shyamji Temple. 10. 3:00 pm – Visit Perfume Shop – Itras / perfume oils are the purest non-alcoholic natural fragrances which are long lasting and soothing. These rare perfumes mature over a period of time, taking 5-7 years to reach full maturity. As they grow older, they go thicker, darker and develop more pleasant smell. 11. 3:20 Achleshwar Mahadev Temple – Achal Nath Mahadev temple was constructed by Nanak Devi, queen of Rao Ganga. The construction was completed on 21st May 1531. A big water reservoir called Ganga Bawari. Some Nagas came and started staying here. One day they saw a cow standing on the sand, with milk trickling from her teats. When the naga baba’s dug the place, they found a Shivling there. 12. 3:30 pm – Visit Kunj Bihari Temple – Kunj Bihari Temple in Katla Bazar was made by King Vijai Singh’s Paswan Gulab Rai in 1779. The outer wall of the temple has pictures related to Lord Krishna’s life, while the walls surrounding it have pictures related to Lord Rama’s life. Krishna’s stories include marriage of Devki Vasudeo, Kans Vadh, Raslila of Krishna and Radha, serving of Amrut of Dhruv, serving of wine to Rakshasas, Gods preaching Arjun, welcome of sudama, Gajraj Udhar etc. 13. 3:40 pm – Visit Sarafa Bazar & Katla Bazar – It is one of the most popular markets of Jodhpur. This shopping area is famous for Gold Smith shops, garments, accessories, clothes and many more. Dress materials of bandhej and lahariya style are most common in the shops of Sarafa Bazaar. 15. 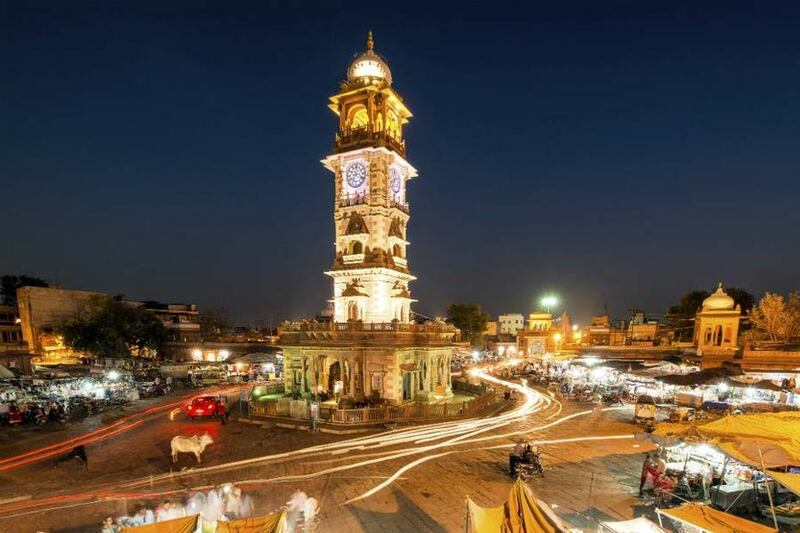 3:50 pm – Visit Clock Tower – Clock Tower was built my Maharaja Sardar Singh. The main attraction of this place is Sardar Market, inside this market there are plenty of shops for antiques, cloth market, grain market, vegetable market, bangles shop etc. Please Note: This heritage walking tour will start from Mehrangarh Fort at 8:30 am and will end at 4:00 pm (includes lunch and rest time).